In addition to the odd coincidence of meeting Anthony in Chicago, on April 15th the Tampa Bay Times published the article “Mythbusters’ star: Bring back band, shop class if you want better test scores“. I’m a big fan of Adam Savage and I am also a big fan of learning through building. The school I taught at in Washington state is a Project Lead the Way school so I had lots of great exposure to students who would excitedly share the things they were building or printing on the 3D printer. I hear there is even a Rocket Club there now. I note all this here to be clear that I am a fan of Project Based Learning, but at the same time I see it as something difficult to do well without a lot of time and effort on the part of the teacher–the first of those things being in short supply these days. Also, while PLTW has tried and tested project based curricula, the expertise needed to teach these classes (just check out the engineering classes) isn’t commonly found in the teaching sector. Ugh, I’m rereading the above and it’s depressing me. I get all excited about doing large projects and then my brain fills with doubts about how to pull them off. This is why I like listening to people like Anthony–the ones that were in a tough situation and made it work with extremely limited resources. While he’s now at Providence College in Rhode Island, Anthony taught in New Mexico and much of what he shared during the session was from his time there working with middle schoolers in a K-8 tribal school northwest of Albuquerque. With few resources and struggling to reach his kids, he pulled on his understanding of some of the leading educational research by folks like Dewey, Vygotsky & Csikszentmihalyi and his own belief in working with ones own hands to engage students in projects. During the session Anthony shared photos and examples of some of the things he and his students did, including a gardening and bench-building project. For the latter one I have to admit initial skepticism about the rigor of such an activity for middle grades students. Benches? Really? But then he explained how used the bench-building project to pull together ideas of/had students practicing measurement, estimation, building prototypes, scale drawings, selecting materials, etc., and my skepticism waned as I’d not considered all the little extensions that could get incorporated into such a project. When Anthony shared the story of how sometimes contractors who come and do work on the reservation sometimes only do the bare minimum (‘build a baseball field’ becomes ‘build a simple backstop while ignoring the field and seats’) and then how this project linked together mathematics and building scams into something with a focus on helping the community for these students I was completely sold on the value of such a project. The most daunting thing to me about Project Based Learning is finding the question. Sure, math is all around, but some projects, like the bench building one, seem like a one-use only unless the town wants to fill up with benches. But perhaps the solution to that is making contacts with the community and trying to address the real needs of the people you see everyday. That still feels like a lot of effort on the part of the teacher to figure out good context for projects, but Anthony had the room spend some time collaborating at tables and thinking of realistic context that he said he would compile and share. I’ll post a link here once I get it from him. Or perhaps encourage him to post a link in the comments (#unsubtlehinting). Related to the table sharing and possibly my favorite comment of his entire talk was when he discussed the many threads that weave into project based learning (left page of notes) and strongly encouraged collaboration with other teachers and that we should “find a partner in crime”. I love that sentiment. Teaching in isolation is so very hard and having even one voice to work with and bounce ideas off of is so productive. For a first session to attend my NCTM was off to a good start. Many thanks to Anthony for sharing his experiences and thoughts! For those looking for some extended reading, some googling turned up a paper he wrote on the bench project that you can check out here. And Anthony is on twitter! Links to the prezi and the ppt Anthony used in his session. 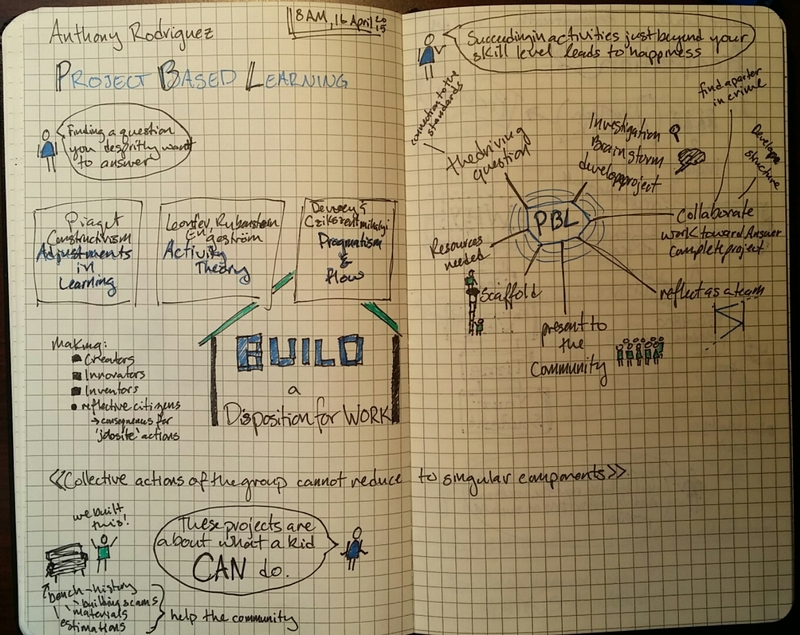 Good info in these for folks looking to dig deeper into Project Based Learning! ← Session Thoughts: NCSM Ignite! This is so cool! If I had the talent to, I could have sketch noted the presentation. This sketchnote is a 2.0 version of the NCTM presentation. Thank you Ashli! #unsubtlehinting – no one misses the subtle like I do. Here is the link to one part of the presentation, basics of PBL, background, and theoretical frameworks that support it. I will send you the powerpoint as well, not sure how to load that one here.